← The Audio Book for “I Might Be You” is Here!! This entry was posted in AutCom Conference, Autism, presume competence and tagged Amanda Baggs, Autism, autistic, Carly Fleischmann, presume competence, Sue Rubin, Tito Mukhopadhyay. Bookmark the permalink. How wonderful ❤ I know you would not put Emma’s typing on this blog without Emma’s permission, and I want to tell Emma how HAPPY her message makes me! Thank you, Emma! Keep typing and communicating, sweet wonderful girl! I can’t wait to meet you, and sing with you, and dance together, too ❤ Life offers so much fun when you can share with others what only you alone can give. One of these days Chou Chou… one of these days we girls will get together! You’ve got a Facebook message re this post, I’d be happy if you checked it. Petri ~ I’ve looked everywhere and do not see a message anywhere on FB from you. Is it possible it didn’t get posted? It’s probably hidden away in the “other messages” page, but you should know that most things posted are republished on many places, I’ll mail the message but it’s about a file robots.txt that’s a great idea to know about. Oh good! Thank you so much Petri, I really appreciate it. I think maybe it may be my own autism, but I always assumed that my (youngest) son would learn to communicate somehow. I was unsure how, and still am, but I know there is a method out there for him, somewhere. We have to keep trying, and fitting life to him. He will let us know what is comfortable for him if we pay attention. For now he communicates by behavior, and I always try my best to listen. Having children on 2 different ends of the spectrum gives me the opportunity to see so much of the variance of the spectrum. One child, I have to be vigilant that they are not pushing him too hard at school., and giving him the accommodations he needs, and the other I have to check in frequently to be sure they are not just letting him play all day, and not teaching him anything. I always try to write with my boys in mind. I believe that they may not love my every post, but none are too harsh, or undignified. I try not to speak too much about things I think would embarrass me, but I’m not that easily embarrassed. I love that you always assumed your youngest would communicate! It’s such a great thing to assume… Everyone in my family is so much happier now that I’m assuming that too, amazing what a stress reliever that is… for all of us!! Yup, Em types some days and others not so much too. You are saying everything I think and wonder and ask and yeah… *nods* I really hate hearing about developmental windows and functioning levels and all the things that made me so terrified, while doing nothing to help me help HER! Great post. My daughter is verbal but I learn so much about communication from your posts. You are good at putting into words what some of us have in our minds. Aw… thanks so much Mandy. Really appreciate it! I would say this is he norm that children have an innate ability to communicate and respond to language. We are the ones who need to identify and adapt to their media of communication. It is far too easy for society to dismiss non verbal kids as slow learning or disabled, because then there is no burden of duty to care for them. The beauty of kids such as Emma and going back to Helen Keller is that they challenge existing mindsets, show us that we are the ones who need to change, not the. They teach us that nothing is impossible, even when we as adults fail and lose hope. My 5yr old son developed symptoms of brain injury after his 4th dtap vaccine. We had no where to turn, but to the children’s hospital where he was promptly given a diagnosis of autism because of the severity of his symptoms. Although he has the ASD diagnosis, I have focused largely on rehabilitative rather than behavioral or biomedical therapies. However I do give him vitamin B to help heal the nerve damage. He has generalized apraxia, speech delays, adhd and sensory processing challenges, but I have always presumed he was competent enough to learn. I noticed he responds well to cues and hears better when I speak into the palm of his hands and so we are now going to learn cued speech to help him overcome language challenges posed by the apraxia. At some point, he will learn typing, but we want to try the cued speech first. “It is far too easy for society to dismiss non verbal kids as slow learning or disabled, because then there is no burden of duty to care for them.” Wow! Yes… gosh that is so depressing and so horrifyingly true. My son started typing at 10, and is now 14 and going strong. I can’t begin to tell you how many times I’ve been told, “Your son is one-in-a-million!” “It’s a miracle!” “He’s a savant!”, etc. And, each time, I say — trying to be gentle, but firm — No. He’s not. Yes, he’s a thoughtful, wonderful boy, but he’s not a savant. He’s a person who has finally found a way to communicate with the world the thoughts, feelings and opinions he’s been wanting to share all along. That’s it. It’s one thing coming from “professionals,” but what’s especially sad to me is how often parents of kids just like my son will reply, “Oh, but my child could never do that,” or “He’s just not as smart as your son,” or “Little Sally just isn’t deep,” or “Yes, but the experts say my child is also mentally retarded.” etc., etc., etc. So, I thank you for writing about how your thinking changed over time. My son types regularly about how heartbroken he is for his autistic classmates who haven’t learned to type/communicate yet, and how unfair it is that he now gets to be educated, but they’re still stuck in “low functioning” classrooms, feeling bored, disrespected, and lonely. It is heartbreaking, and it’s wrong. And the prevailing wish to label children like ours “miracles” or “exceptions” perpetuates that injustice. Oh I love hearing stories like this!! And do you know what’s astonishing? Most *typical* kids aren’t taught to type until middle or high school. I was 14; kids who put the class off were older. My mother never actually learned; she was amazed to learn recently that I could. It’s just so wrong that presumptions are made about what anybody can’t do, if no one even tries to teach them. My son was introduced to typing in grade school, but he was highly motivated because of wanting to access the computer and play videos and other things. Em taught herself to find her favorite youtube videos when she was about 6, now she’s an old pro. She navigates youtube faster than anyone in our home! I always think about living in New York City and learning to drive a car or ride a bike. Many young people who grow up in this city don’t learn to do either, yet none assume they cannot learn or won’t learn. 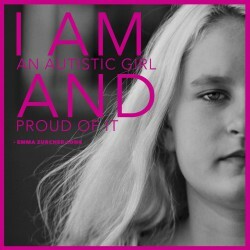 It is surprising how often these assumptions are made when someone is Autistic. <3. and lots of it. Emma, we hear you. You are working so hard to be understood, to make us know your thoughts. Thank you for never giving up. Yes, she is. Thanks so much for writing this! It is great to see you presuming competence and personhood for your daughter – everytime I look into the difference between autistic success and failure it seems to stem from expectations and provided opportunities. I am an Aspie and do not see myself in the least bit disabled, though I certainly am different in some key areas, I grew up believing I could do anything because I was told I could and I am sure this is the key to all success but especially autistic success. Thank you Emma. (Another Emma!!) Wonderful to hear you grew up being encouraged and given opportunities! Wise words from an autism Mom who gets it right! 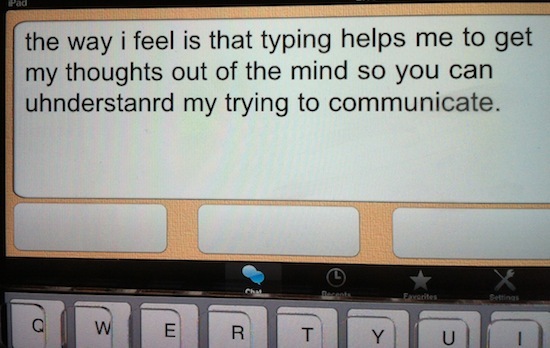 I am so looking forward to when my little MissG can use a keyboard to enhance her communication! She may be verbal, but I can see how having an alternative will be useful for her. Please tell Emma that I am thankful to her for sharing her words because they encourage me. You’re right it’s not a miracle it;s the norm the way the media potrays people who are different is quite patronizing they applaud us for doing things we’re supposed to be doing. Autism isn’t distinctive in how people despise it. See Crossley’s Speechless: http://www.annemcdonaldcentre.org.au/speechless which covers CP, ID, and other related conditions. A disability-wide movement is needed. Thank you so much for the link, Chris. Really appreciate reading it! You posted this on the day my funny, smart, amazing child turned 15. Upon his diagnosis, his 1st teacher gave me the best advice I ever received. She said, “Now that you have a diagnosis, don’t begin to expect less from him. You need to ALWAYS expect more.” That was my introduction to ‘presuming competence’. Although I too experienced a great deal of panic in those early days, I have never forgotten those words, and IMHO they have served him very well. Those words taught me to turn away from doctors & teachers who said “can’t, won’t, never”. My son was non-verbal when he was diagnosed. Today he is planning his career as a professional ventriloquist & comedian. No one can predict what ANY child will, or will not achieve in their lifetime. If I may, I would recommend another book to you – Reasonable People – A Memoir of Autism & Adoption by Ralph James Savarese. It’s a great story of DJ Savarese and his emergence as he found his voice. Keep the faith! Emma is going to continue to amaze! Aw.. happy Birthing day, Holly and Happy Birthday to your son! So funny you recommended Ralph’s book, i finished reading it a few weeks ago. I found his description of how long it took, helping DJ type and his detailed description of that process, invaluable. We are meeting each other this summer and have been in touch. I have his book on my resources page! That’s wonderful! Guess I should get busy and look at your resources page! LOL Ralph & Emily are friends of my high school sweetheart & his wife. It was he who turned me on to the book when he learned about my son. I love, love, love the way Ralph refers to DJ as an autist! It’s one of my favorite things about the book. I am sure much more ‘good stuff’ will come of your meeting! The reason autism is so misinterpreted is because most people dont know anything about it. and the media shows it wrong because they dont know either. a non verbal child can be this way because he/she cant put the pictures in his head into words. but communication skills get better as one ages, both nts and kids on the spectrum. a non verbal child might start talking later in life. Temple grandin didnt speak until she was 4 years old. of course there’s sign language and ways to communicate without words, and there are ways to teach non verbal children to talk. great post. i shared it on tumblr and stumbleupon.